ACADEMY ref 4409 . 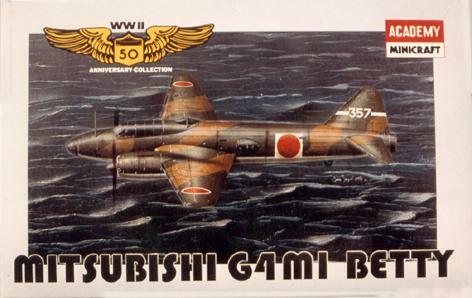 1/144 Mitsubishi G4M1 Betty  . Originally issued in 1993, this kit received in 1995 a logo « 50th anniversary of WW2» and a box illustration by French artist Jean-Jacques Petit. Reissue of a Crown-pedigree kit , this remains the most available kit in this scale, even if not as detailed as the Imai-pedigree version. Side windows are figured by decals which is still acceptable in this scale.